Optical Polishing of Polystyrene Discs to Specific Dimensions. Lapping and Polishing Si Die and Wafers. Lapping and Polishing Si Die to Optical Polish Quality. Specimen Preparation System for Analyzing Fish Otoliths. Sample Preparation of Optical Crystals Cutting and Polishing Methods. Lapping and Polishing GaN Fiber Towers for VCSEL Applications. Parallel Lapping of Devices for Deprocessing. Evaluation of the Polishing Quality for Edge Polished Silicon. Monitoring and Measuring Plate Flatness During Lapping. Improving Surface Quality of Petrographic Sections. Processing YVO4 and Electro-Optic Crystals for Small Scale Fabrication. Lapping and Polishing II-VI Semiconductors. A Method for PVC specimen preparation. Evaluating Surface Roughness of Si Following Selected Lapping and Polishing Processes. Basic Arrangement of Model 910 and 920 for Processing Cross Sections. A Simple and Repeatable Stage Alignment Procedure for the D500i Dimpler. Setting up and Using Digital Micrometer Controlled Lapping Fixtures. Composite Plate Conditioning for Flatness. Cross Sectional Preparation of KA-160 7mm Catalyst Support. Specimen Preparation of Sardine Otoliths. The Model 920 is the first in a new generation of multi-purpose lapping machines designed for accurately lapping and polishing a wide range of materials. The 920 can be used as a standard metallurgical grinder/polisher utilizing abrasive papers, abrasive films, diamond discs, polishing cloths, etc. Or it can be used as a high precision free abrasive lapping machine for flat polishing of optical and semiconductor materials. 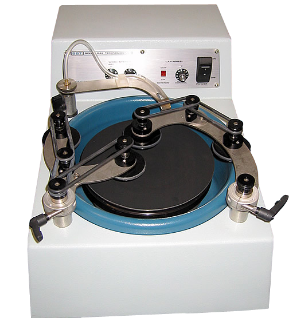 When used as a free abrasive lapping machine, the 910 can accommodate most SBT Lapping Fixtures for precise sample orientation and maximum flatness. The precision fixtures and the self-truing lap ensure samples of the highest quality. In addition to flat lapping, SBT offer 2 fixtures for polishing oriented crystals. The crystals can be oriented and subsequently polished while maintaining their orientation. The 920 is also available with two optional workstations. These independently controlled workstations rotate SBT polishing fixtures automatically thereby simplifying the polishing process and minimizing operator supervision. The 920 is ideal for high precision polishing in both R & D and production environments. Model 920 is pre-wired for two workstation accessories, has water and slurry delivery system.